Here is a super easy salad recipe that is perfect for a summer cookout but also works greats in the winter too! Good news…it is 100% Paleo…dressing and all! Top it with grilled chicken for a complete dinner! Directions: Begin by toasting your walnuts and poaching the pears. Slice the pears into thin strips and place into a pan with water. Bring the water to a boil on medium to low heat. When the water starts to boil set a timer for 5 minutes and let the pears poach at a low heat. While the pears are cooking you can assemble the dressing. In a food processor puree the olive oil, raspberries, and orange juice. Adjust the amount of orange juice based on whether you want your dressing thicker or thinner. After five minutes remove the pears from the heat and make the salad. In a bowl, combine the spinach, carrots, walnuts and pears, and toss with the dressing. Serve with the goat cheese on the side as an option. We served this at our Fourth of July Cookout last week and it was a perfect healthy addition to some of the other not so healthy foods. For me it rounded out the perfect healthy cookout plate! 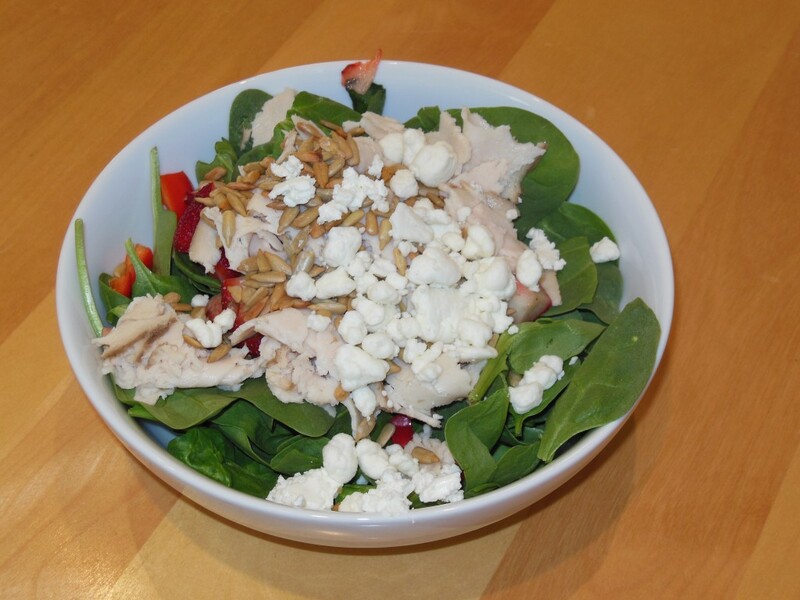 It has baby spinach, crumbled goat cheese, fresh fields chicken breast, red pepper, strawberries, and 2 tbs. of sunflower seeds! Here’s another salad I just had for dinner a couple nights ago…recipe is coming soon! And another awesome recipe experiment coming soon! 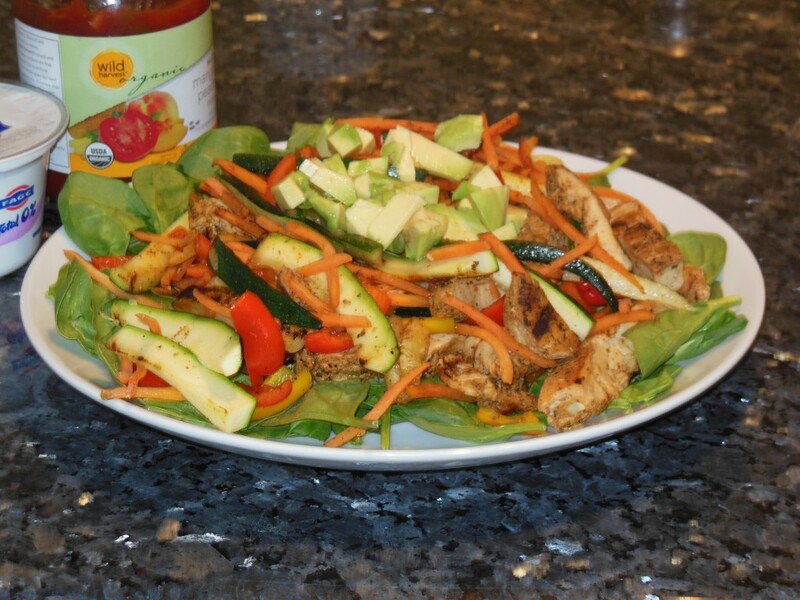 Another favorite of mine is a raspberry, orange, and chicken spinach salad. What’s your favorite Salad? Salad topper? Are you a fruit salad or veggie salad person? 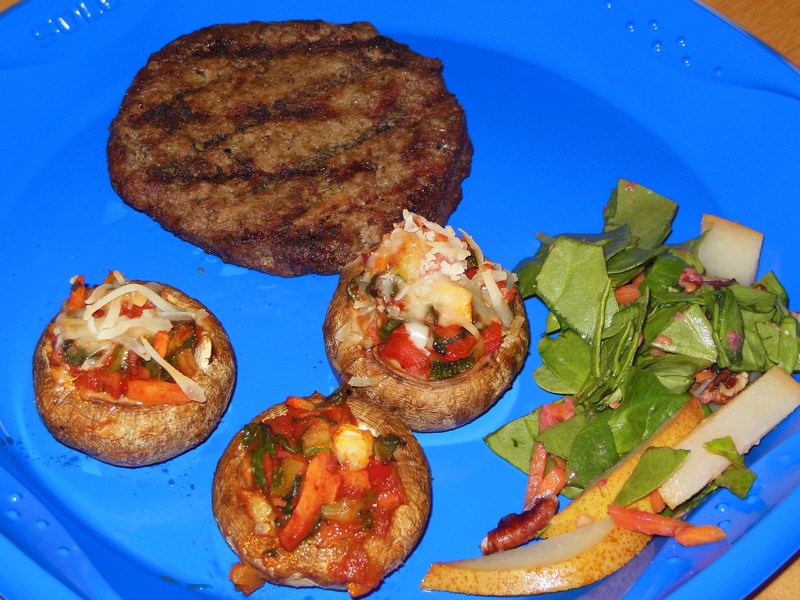 This entry was posted in Recipes on July 10, 2012 by danielle. Yum! That sounds so delicious! I will have to try that combo! yum! 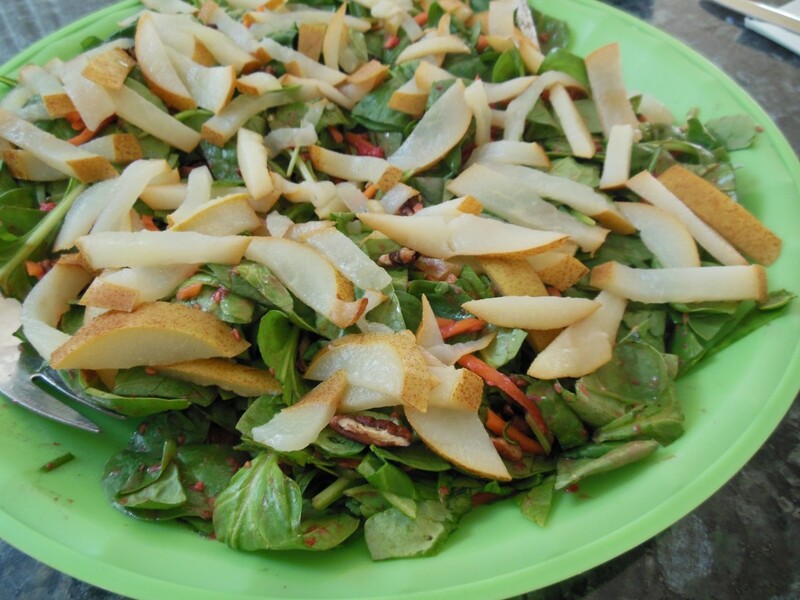 i love pears in salad! Me too! Any salad with fruit is great in my book! That’s so funny! I am like that with baby spinach! Can’t eat a salad without it! The shrimp salad was last nights dinner and was so good! Recipe will be up on Sunday! Salads are my go to BBQ foods because I can bring them and know I’ll have something to eat too! you are spot on, girlfriend.. bring them to BBQ’s.. not only do other people like it, but YOU have something you want to eat and don’t feel like you are sabotaging yourself! Totally! Get everyone eating better! Salads are my cooking weakness. I can make all sorts of delicious meals, but when it comes to simple salads, I often fail. I just never love them when I make them! I know it sounds silly, but it’s true. I’m often jealous when people seem to make so many great salads. They just never turn out for me, or maybe they do and I’m just not satisfied – who knows! All of your salads look amazing! One of my favorite combos is arugula (like Eve!) with grilled chicken, avocado, strawberries, and walnuts. YUM! Thank you! That combo sounds delicious! I love avocado on my salads! Pear and walnut is such a fantastic combo. I’ve never done it with raspberries, too. 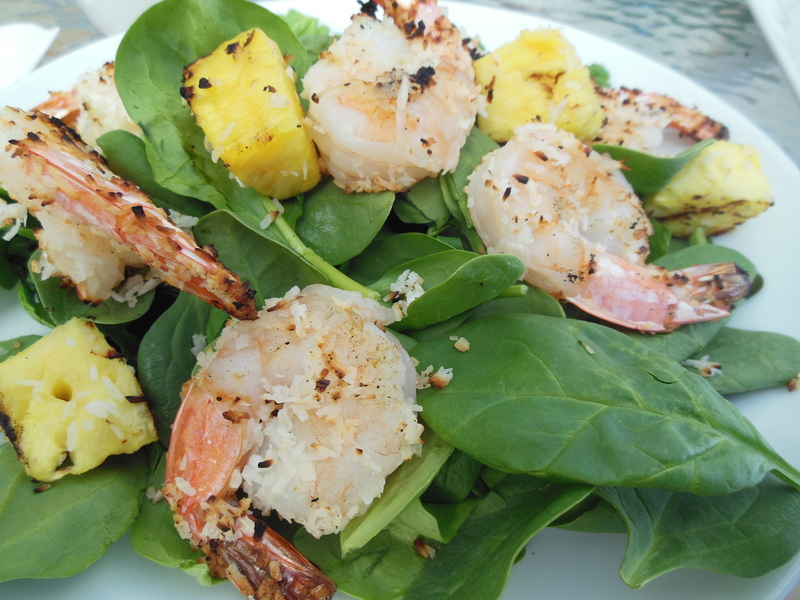 Great idea for a gorgeous summer salad! Thanks! The raspberries were great with the pears! My fav salad is Mango Chicken. Yummmm! I’d have to say veggie salad with some fruit in it is my kind of salad. For toppers, sunflower seeds, avocado, fresh salsa. I’ll be trying the pear too! Wow! Never tried mango chicken salad but I think I need too! Sounds awesome! I love mango and pineapple together! Perfect summer combo! Salsa! Is that strange? I adore having salsa as a dressing on my salads. The pepper/tomato/onion mix just gives great flavor! Not at all I actually think it sounds delicious! I don’t really like dressing so that would be a perfect swap for me! MMM, it all looks good! I’m more of a veggie salad person but I don’t mind mixing some fruits in now and again. Thanks! I’m totally a fruit person but wish I liked veggies more! They’re so good for you! mmmm what a tasty recipe Danielle! Pears are just great when they are nice and ripe, and with walnuts, just a wonderful combination! Thank you for this idea I like to add strawberries, blueberries and clementines on my salads.. oh and grapes too! Ahh yum! I love fruit on my salads too! Anything to disguise the veggies 😉 Never tried grapes in my salad! I’m going to have to test that one out! I love southwestern salads with beans and corn although I’m not sure if that is paleo? I also love strawberries in my salad! You are so brave! I never put fruit in my salads. It freaks me out. But it always looks so good! I have to tell you. I bought the paelo diet book and I’ve been reading it, seriously because of your blog. All your food looks so awesome and I know my tummy/intestines would love it. How do you do the paleo diet? It seems like there are lots of different ways to approach it. Mmmmm, I always forget to add fruit to my salads but it tastes amazing. Thanks for the reminder! No problem!!! It’s so good! I am all about the salads for lunch! 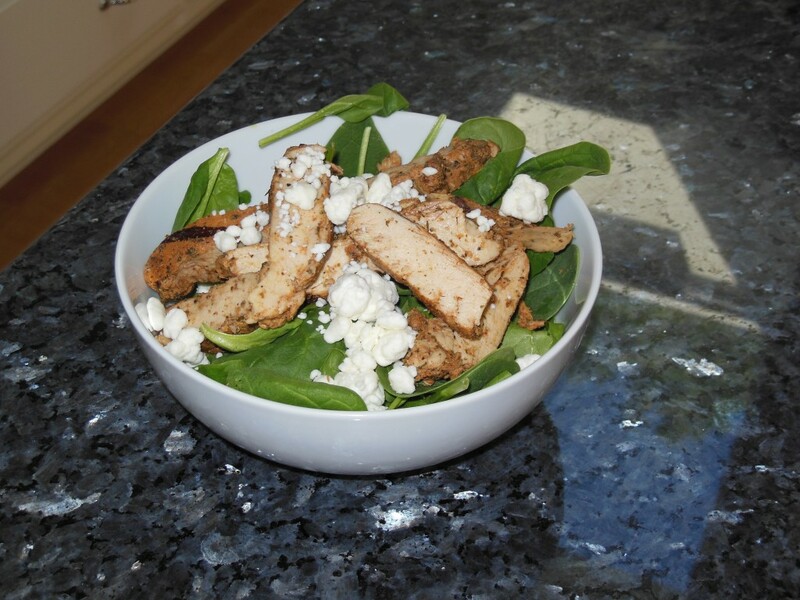 I enjoy the spinach-chicken-goat cheese combo too, with some shredded carrot and cabbage for a little crunch. Also I found that as long as I have some sort of cheese, bacon or nuts on my salad I don’t need any dressing.